Sadly, Peter Firmin, “father” of Bagpuss and Basil Brush, passed away yesterday after a short illness, aged eighty-nine. In addition to the old, saggy cloth cat (baggy, and a bit loose at the seams) and the anarchic fox (boom BOOM! ), together with Oliver Postgate, Peter brought many other childhood favourites into our homes. These include, The Clangers, Pogle’s Wood, Pingwings and What-a-Mess. 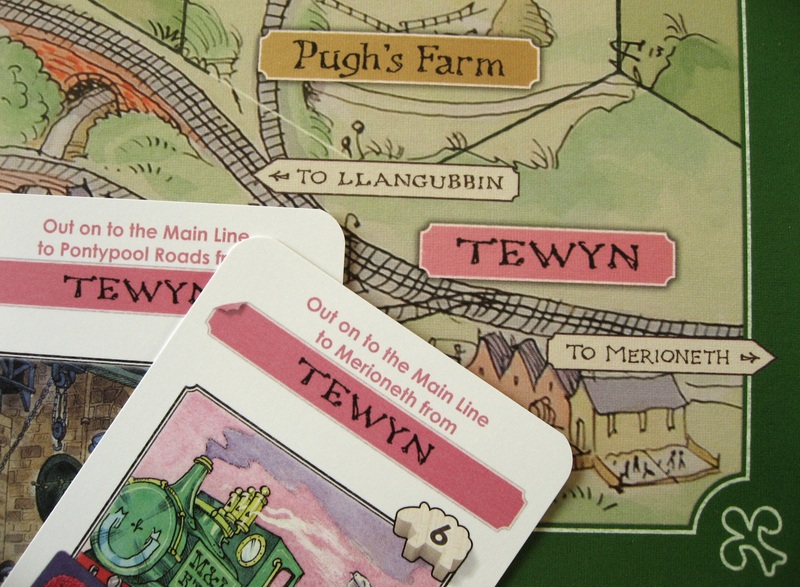 To gamers though, the most interesting are probably Ivor the Engine, Noggin the Nog, both of which have recently inspired boardgames that Peter Firmin personally illustrated in his unique and beautiful style. He was a lovely man who will be greatly missed by all who knew him and those who were inspired by him. This entry was posted in News and tagged Ivor the Engine, Tales of the Northlands: The Sagas of Noggin the Nog on July 2, 2018 by nannyGOAT. Unsure of who was coming, to get everyone in the mood, we started off with the quick set collecting game, Coloretto. We’ve played this little filler a few times, but somehow, Red felt she’d missed out. The game is very simple: on their turn the active player either draws a chameleon card and places it on a “truck” or takes a truck (which means they’re out for the rest of the round). The idea is that players are collecting sets of cards, but only three will yield positive points, with the rest scoring negatively. The really clever part of the game is the scoring which uses the triangular number sequence (one point for the first card, three points for two cards, six points for three cards etc. ), which rewards one large set more than two or even three small ones. It was very tight between Blue and Ivory who both picked up sets of six, but Blue finished one point ahead thanks two her second set, three green chameleons. With everyone arrived, we moved on to the evening’s “Feature Game”, Marrakech, a very simple little area control game played through the medium of the Persian rug. Played on a small grid, each player starts with thirty lire and a pile of pieces of carpet. On their turn the active play can rotate Assam, the master salesman a maximum of ninety degrees left or right, before they roll the die to find out how far he must be moved. If Assam lands on a carpet square of an opponents colour, then the active player must pay the owner “rent” equivalent to the total size of the carpet. Once Assam has been moved and any dues paid, the active player places a strip of carpet. The carpet pieces are all the same size (twice as long as they are wide) and cover two squares on the board. They can also overlap with pieces laid previously, but cannot be placed wholly on top of one single rug. This is where the strategy comes in – is it best to try to make a large contiguous area which will be very lucrative every time someone lands on it (but that players will avoid if at all possible) or is it better to make many small areas that players will be more likely to land on? The game ends when everyone has played all their pieces of carpet and the winner is the one with the most money (each visible piece of carpet earns its owner one lira). 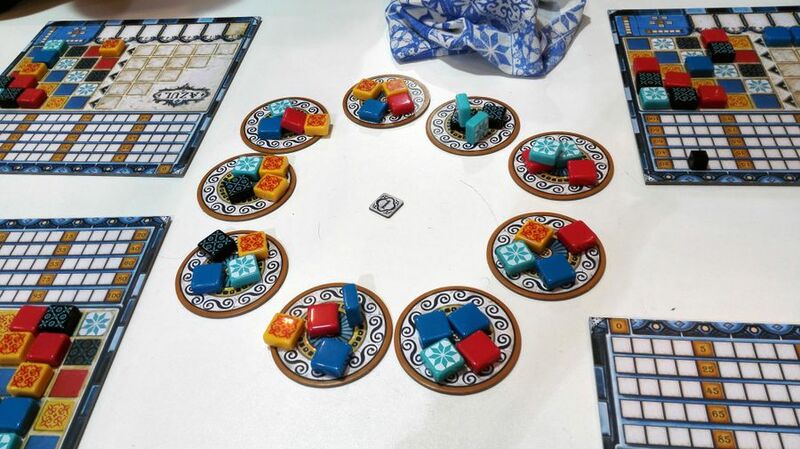 Marrakech is a nice little game, but what really makes it is the quality of the rendition. Assam is a beautifully made and painted wooden piece; the “coins” are wonderfully tactile wooden discs and the carpet is well, a strip of coloured fabric. Without these touches, the game would still be as good, but would be very abstract. We had two copies and plenty of people who were interested in it (to quote one of the GOATS, “I want to play the carpet game!”), so we played two parallel games. Red, Blue, Ivory and Pine were first to get going with the slightly newer, brighter version of the game. Pine and Red started out quite aggressively building large areas of carpet, trampling on each other and Blue and Ivory in the process and building a mini-carpet-mountain seven or eight layers high. Throughout, it felt tight, but in practice, there was only ever going to be one winner and Red finished eleven lira ahead of Blue in second place. On the next table, playing with the more traditionally “sandy-coloured” version, Green, Ivory, Purple and Black were playing a slightly more strategic and less vindictive game. The result was a closer game with everyone within four points of each other, but was won by Green, just two lira ahead of Black. With both games finishing almost simultaneously, there was a quick bout of musical chairs, with Green joining Ivory and Blue for a game of Ivor the Engine (its first outing with the “mammy sheep” picked up at Essen). This is a cute little game with a viciousness that lurks just below the surface and belies the gentle art-work from the Ivor cartoons as drawn by Peter Firmin. The idea is that players are travelling round Wales collecting sheep and the person with the most sheep at the end of the game is the winner. 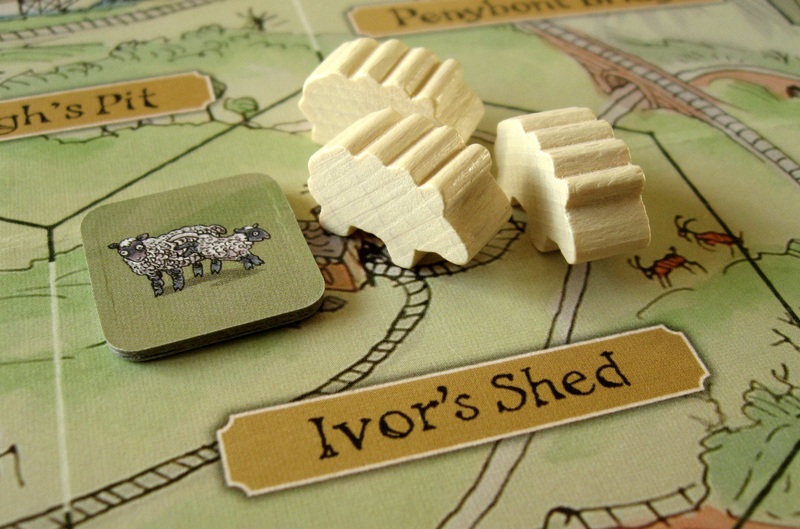 A single sheep can be collected whenever you start your turn on a town or village with sheep in it, but more sheep can be collected if you are in a town or village without sheep and perform a task to “help Ivor”. Helping Ivor comes at a price, however, as in order to do this you have to play one of the dual-purpose cards from your hand, which means you cannot use it to help you in other ways. At the end of your turn you add one card to your hand from the face up displayed cards, however, when the chosen card is replaced from the draw-pile though mixed in with the errand cards are event cards which can be nice or nasty. Blue got lucky, and started off in Grumbly Town which happened to have only one sheep. Since she also had a card for Grumbly Town, this meant she could pick up the one sheep and then play the card to help Ivor, netting a total of six sheep before Ivory had even had a chance to take a turn. That was where her luck finished though, and Green soon caught up quickly followed by Ivory. The cards fell well for Green as he picked up several cards for Tewin as he traveled to the south-east corner of the board picking up lots of sheep as he went. Ivory had a little poke at him, taking a couple of his sheep when he had the chance, then , out of fairness, he then had a go at Blue, taking both the last sheep and the lost sheep token from her current location. Next turn, Green did the same to Blue and just to compound things, “the game” joined in, giving a total of nine sheep she’d missed out on. Feeling rather “got at”, and in desperate need of time she tried to stop Green from finishing the game by doing the only thing her cards allowed her to do – put sheep in Tewin to slow Green down. It was all too little too late, and twenty-five sheep is not an awful lot, so it wasn’t long before Green passed the threshold and triggered the last round. Still with no useful cards and in a position that was not going to trouble the scorers, Blue was forced to do nothing, leaving Ivory to do what he could to catch up. With some effort he was able to cross the line, but was still some way short of Green who still had his final turn to come. In the final accounting, Green finished on thirty-five, nine sheep ahead of Ivory, and more than twenty clear of Blue, in what had been a very unforgiving game. Meanwhile, Red, Black, Purple and Pine were looking for something to play. With Burgundy away worrying about his MOT, Pine fancied his chances at Splendor. We’ve played this little chip-collecting and card development “engine building” game quite a bit, but we all still seem to quite like it when we are looking for a light filler game. Since Black, Purple and Red had also suffered at Burgundy’s hands recently, they were very happy to join Pine in the certain knowledge that, for once, Burgundy wouldn’t win. The idea of the game is that players collect chips to buy gem cards which can, in turn, be used in lieu of chips. More expensive cards are also worth points and the game end is triggered when one player reaches fifteen points (and the round is completed to give everyone the same number of turns). Points are also awarded for “nobles” which go to the first player to get a specific combination of gem cards and the player with the most points at the end is the winner. Everyone was up for it, and it started out with players taking it in turns to pick up cards, keeping everyone guessing as to who had the edge. Before long, Black, Pine and Red edged ahead, then suddenly, Black declared he had fifteen points and everyone else panicked. It wasn’t long before someone smelled a rat and there were demands for a re-count. With the discovery that Black had miscounted and only had fourteen points, there were the inevitable tongue-in-cheek accusations of cheating and a second “final round” began. Although this gave everyone a second chance, it wasn’t quite enough, and Black won with eighteen (despite “cheating”). Pine finished in second, three points behind, so he’ll have to wait a little longer to win Splendor. One thing everyone was pleased about, however, was that at least Burgundy hadn’t won, and that was almost as satisfying as beating him, though not quite, obviously. With Ivory and Green heading off early, that left five players and a debate as to what to play next. Somewhere in the discussion “Beans” got a mention, and from then on, despite conversation moving onto Christmas music and everyone’s favourite version of “The Bean Rhyme” (“Beans, beans, good for your heart…” – who knew there were so many different versions? ), the final game was inevitably Bohnanza. This game is very simple: in front of each player are two “Bean Fields” and on their turn, players must plant the first card in their hand and may plant the second. Once the active player has planted the card(s) from their hand, then they turn over the top two cards from the draw deck: these must be planted by the end of the turn, though not necessarily in one of the active player’s fields if they can be traded. Once all these cards have been planted, the active player can then offer to trade any unwanted cards in their hand before their turn ends with them replenishing their hand from the draw deck. The catch is that players are not allowed to change the order of the cards in their hand which must be “planted” in the order they arrive. However, it is possible to remove unwanted cards by trading them away (either during their turn or with the active player). This simple mechanic coupled with the different availabilities and values of cards when they are harvested, are the critical parts of the game. Thus one of the key points is the ability to value a bean and not overpay for it, or equally important, not give it away for less than it is worth. The problem is that “value” depends on perspective, and this caused an otherwise friendly little game with a bit of bite to become a little bit nasty. Blue had picked up and planted the first two Cocoa beans, so when Purple drew a third, Blue asked whether she would trade. Blue didn’t have much to offer, but offered what she could and pointed out that there were only four Cocoa beans in the game and since we were less than a quarter of the way through the deck on the first pass, Purple could be waiting a long time. Purple had other plans though and commented that it was a very valuable card and determinedly planted it. On her next turn, Blue dug up her pair of Cocoa beans and put both in her money stack. So it was more than a bit irritating for her when she promptly drew the fourth Cocoa bean card. Blue was feeling a bit obstreperous after the rough treatment in Ivor and Purple was unable to offer a good trade. So, much to Purple’s disgust and despite the difficulties it caused both of them, Blue planted the offending bean before immediately digging it up. This had a couple of consequences. Firstly, Blue’s plans were now in tatters, and secondlym Purple had to choose whether to get rid of the Cocoa bean (with singles being hard to get rid of) or whether to wait for the second pass through the deck. Purple doggedly stuck with it, so it was particularly unfortunate when Blue drew the Cocoa bean card almost as soon as the deck was turned. With little chance to get rid of it and still in a very kamikaze mood, Blue planted it a second time before digging it back up again. Purple was not impressed. Fortunately, on the third pass, the Cocoa bean finally landed in the hands of Red. She wasn’t in a silly mood like Blue, so Purple finally got her second Cocoa bean and was able to harvest them for two coins. It was only just in time though and she had played nearly the entire game with only one field, and still finished third – quite an achievement. Red finished in first place, just one coin ahead of Blue who had spent most of the game trying to dig herself out of her self-inflicted mess. Learning outcome: Value is dependent on circumstances and very much in the eye of the beholder. This entry was posted in Games Night and tagged Bohnanza, Coloretto, Ivor the Engine, Marrakech, Splendor on December 28, 2016 by nannyGOAT. With the arrival of Purple and Black (and their pizza), we decided to play another of Red’s favourite games, Bohnanza. It’s amazing how a game that so many people feel is such good fun, sounds so totally uninteresting when it’s explained. True, as White pointed out, this applies to quite a few games, but Bohnanza is definitely the “poster child”. After a quick rundown of the rules, we began. Purple was very generous, offering beans for free at regular intervals, though of course she had an ulterior motive. However, otherwise, as Black commented, “It’s a tough crowd tonight,” as deals were pushed and even turned down. It was fitting therefore, that such a tight game should end with a draw, with Red and Blue sharing the honours. Next, we decided to play something a little deeper and, after some discussion, we opted for one of this years most popular games: Ivor the Engine. Although we’ve played “Ivor” a lot at games night, Red and White were both new to it. It’s a cute little game, though it has a sharp edge if you want to play it that way. With a full compliment of players, it was always going to be a fairly tight game, and although Blue started well with a couple of jobs at Mrs Porty’s House, everyone else struggled as Purple got in their way. Blue was promptly penalised for her good start though, when the first event card came out and caused the leader to lose sheep. Since everyone else had now cleared sheep from the locations that corresponded to their cards, Blue was then suddenly left behind. As everyone galloped on, Red, managed to pick up eleven sheep with one visit to Tewyn! Black was closing in on the finishing line, when Blue managed to complete a couple of jobs at Dinwiddy’s Goldmine and use the gold to buy a couple of event cards. That tipped the balance in her favour and she finished just ahead of Black. We finished the evening with a few rounds of No Thanks!. This is another game we used to play quite a bit, but hadn’t played for six months. It is such a simple, push your luck game that experience isn’t necessary, and it really brought out White’s vindictive streak. After three games, honours finished about even and it was home time. Learning Outcome: Old favourites are still favourites, and for a good reason. This entry was posted in Games Night and tagged Bohnanza, Ivor the Engine, No Thanks!, Walk the Plank! on December 30, 2014 by nannyGOAT. After a bite to eat, we started late with our first game, Indigo and immediately in walked a two more gamers. It is a quick game though, and Yellow in particular was quite fascinated watching. 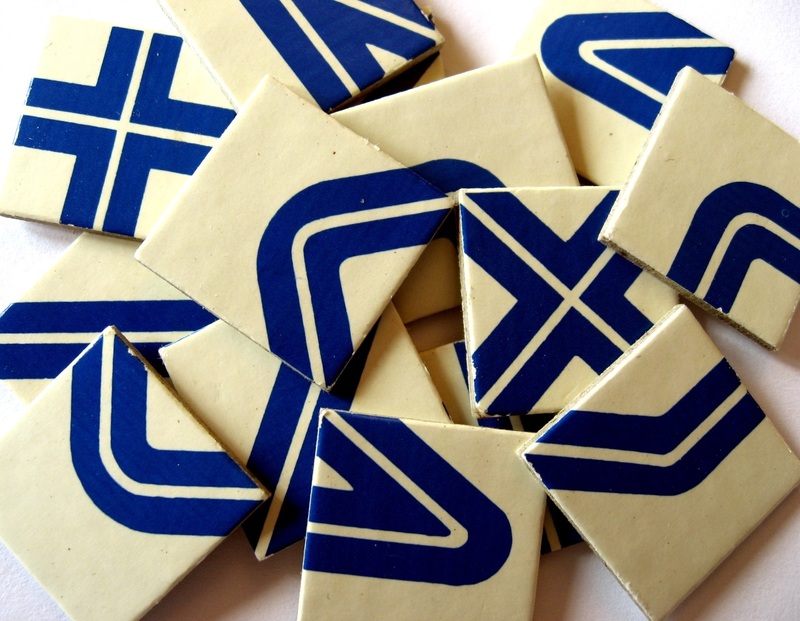 It is a really beautiful and simple yet clever game, based on tile laying and path building. The idea is players have to direct glass pebbles and catch them in their “gates”; different coloured stones are worth different numbers of points. 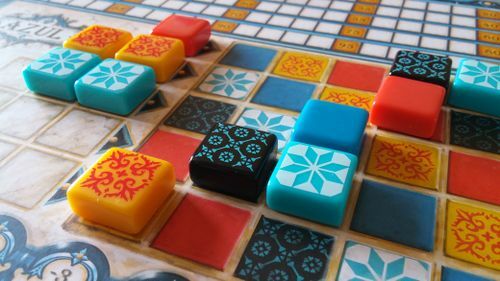 Each player has a single tile and on their turn, they place that tile anywhere on the board in almost any orientation. If the tile extends the path of one of the stones or connects it to another bit of path, the stone is moved along the path to the new end. If a stone arrives in a gate, the owners of the gate get to keep the stone; each stone have a value and the player with this highest total at the end wins. In the four player game, players have three gates each, sharing one with each player, so there is a certain degree of team-work. This was White’s first visit, and it became clear early on that this was not the best game for her as, without her glasses, working out where the blue ribbons go was challenging! Nevertheless, she did remarkably well, especially in helping us make sure Green didn’t win! Red and Blue led the charge and, when Red brought home the blue stone (which is worth a valuable three points), the writing was on the wall – a draw! With a few more arrivals, we decided to play our “Feature Game” next, which was 6 Nimmt! (aka Category 5 amongst other things). This is a much older game (celebrating its 20th anniversary this year), though is also quite simple to play. 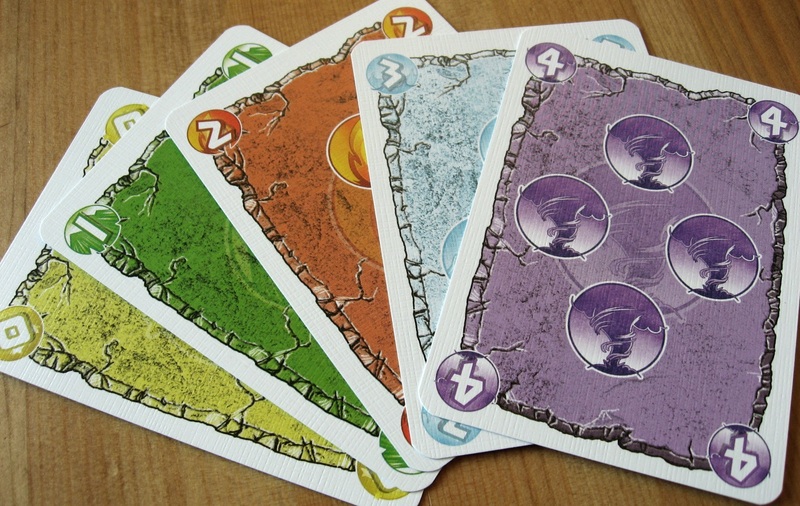 There are four cards on the table forming the start of four rows and players start with ten cards in their hands. 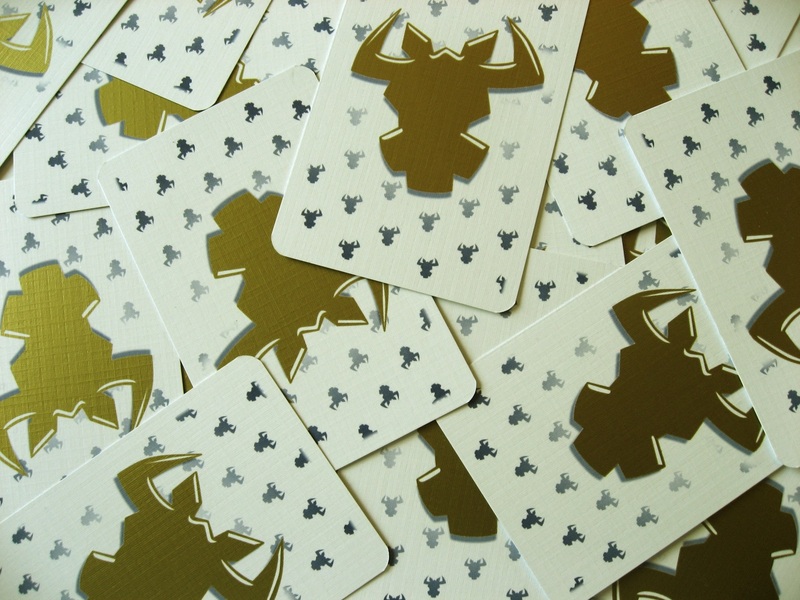 Each card has a face value between one and one hundred and four and features a number of “Bulls Heads” (mostly just one, but some have as many as seven). Basically, players secretly choose a card to play, and then simultaneously show them. The lowest card is then placed after the highest card on the table that has a face value lower than the card they are playing. In this way, four rows are formed. The rows are full when they contain five cards and when the sixth card should be added, the active player instead takes all the cards in the row and places their card down to start a new row. A player scores the number of Bulls Heads on the cards and winner is the one with the fewest at the end. Since the number of cards in the rows increase (making it harder to play safely) and the number of cards in hand decrease on each turn (players don’t pick up after each turn), the decisions get increasingly agonising, especially when the number of Bulls Heads in the rows starts to increase. We checked that Red understood that she wasn’t supposed to be collecting cards and she assured us that she understood this aspect of the rules, however, it wasn’t a surprise when she finished with nearly twice as many Bulls Heads as anyone else! So we decided to play a second round and work our way through the second half of the deck to give her a chance to improve things. Green decided that it was time to “nobble” Blue as she had finished the first round with one Bulls Head, however, he had no idea how to go about doing it, nevertheless, everyone was delighted when Blue was the first to pick up. Red seemed to have got the hang of it this time and managed to get through the whole round without picking up a single card which meant she finished in joint second with Green. 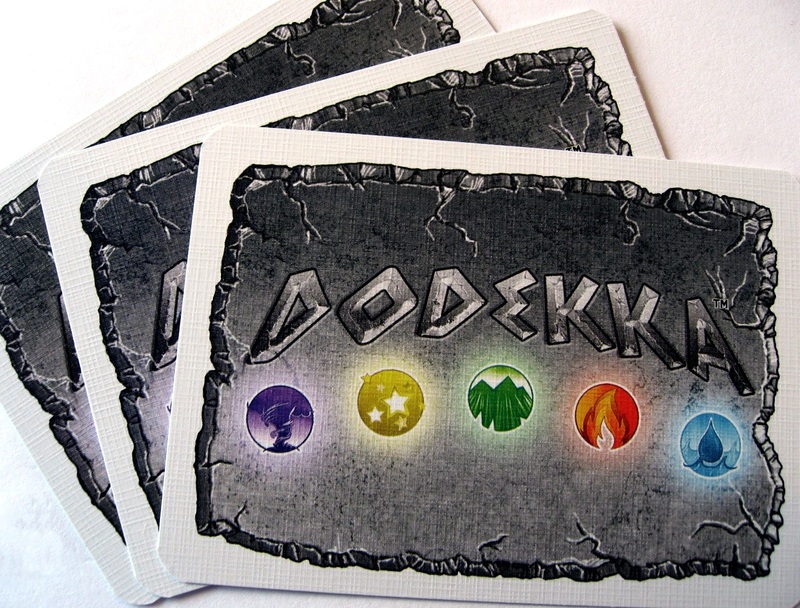 We didn’t have long before people had to leave, so we played a game of one of our new favourite fillers, Dodekka, which has a lot in common with another game we like, Parade. This is a simple little push-your-luck card game, with five different suits, Fire, Earth, Air, Water or Ether each with cards numbered 0-4. The game starts with three random cards placed in a line from the draw deck. On a player’s turn they can either take a card from the deck and add it to the end of the row of cards, or take the card nearest the deck. If the total of the face values of the cards in the row exceeds twelve, then the player has to take the whole row. 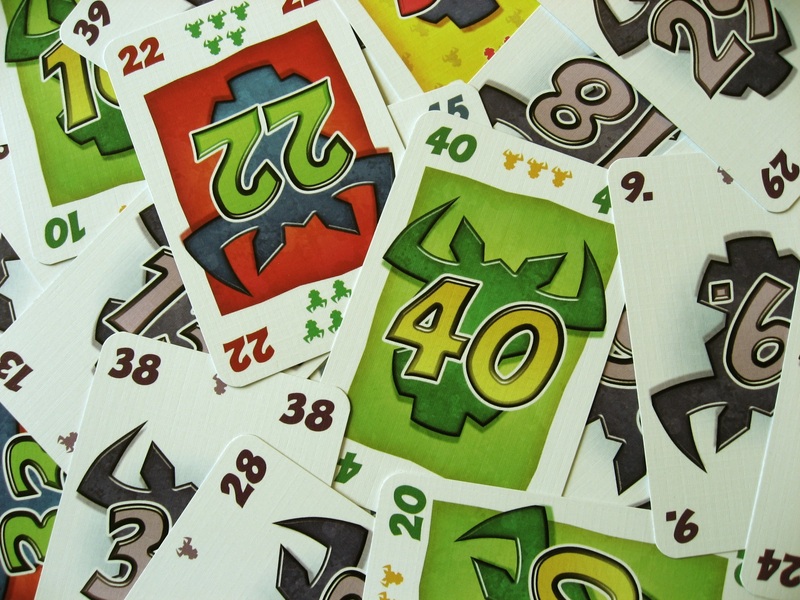 At the end of the game, players choose a scoring suit and add up the face value for that colour, then they subtract the penalty points – one for every card not in their scoring suit. Yellow was the first to pick up a handful of cards, but it quickly became clear that he had a strategy and, as a substantial number of the cards were blue he was hoping to collect enough to offset any penalties. Red, Green and Blue, meanwhile tried to delay picking up cards and then minimise the number they got so they could leave the decision until they were forced to choose. Purple was forced to choose quite early on, but ran out the winner with a grand total of five, just one ahead of Green and three ahead of Yellow. Remarkably, nearly everyone finished with a positive score, which we felt was much better than last time! Next up was another recent favourite in Ivor the Engine. We played this only a few weeks ago, but Yellow has won every game he’s played, so we all felt we couldn’t let this record stand… Yellow started out well early on, with a lucrative job in Llangubbin, but it stayed close. Purple carried out a lot of jobs at Mrs. Porty’s House and then picked up the matching event card to add more points. Green collected a lot of sheep in the Grumbly Town area and then played a handful of cards to do several jobs one after another. When an event card came up that moved everyone to Tewyn, we all payed a sheep except Yellow who followed the move with an ominous number of jobs in Tewyn Beach. Meanwhile, Blue had picked up a lot of cards for Dinwiddy’s Gold mine, but without help was unable to clear the sheep efficiently. So when the matching event card came and went, she changed her strategy and collected a couple of tasty looking jobs in Grumbly Town. When it looked like Yellow was about to finish the game, Blue gave him a lost sheep card, immediately followed by Purple who forced him to lose a couple more sheep. Blue turned her Goldmine cards into gold, then into coal enabling her to move and carryout a couple of jobs bringing her sheep flock to twenty-five, and as the last player in the round, brought the game to an abrupt end. With her extra sheep event card, she finished with thirty, just ahead of Green who pushed Yellow into third, for the first time. With only half an hour left, we decided to play what looked like a quick game in The Great Downhill Ski Game. This is is an old game dating back to over forty years, but was ahead of its time. Basically, players have a hand of ten tiles and on their turn they lay as many of them as they can to create a continuous path avoiding all the trees. At the end of their turn they draw tiles from a face down pool to bring their hand back up to ten. 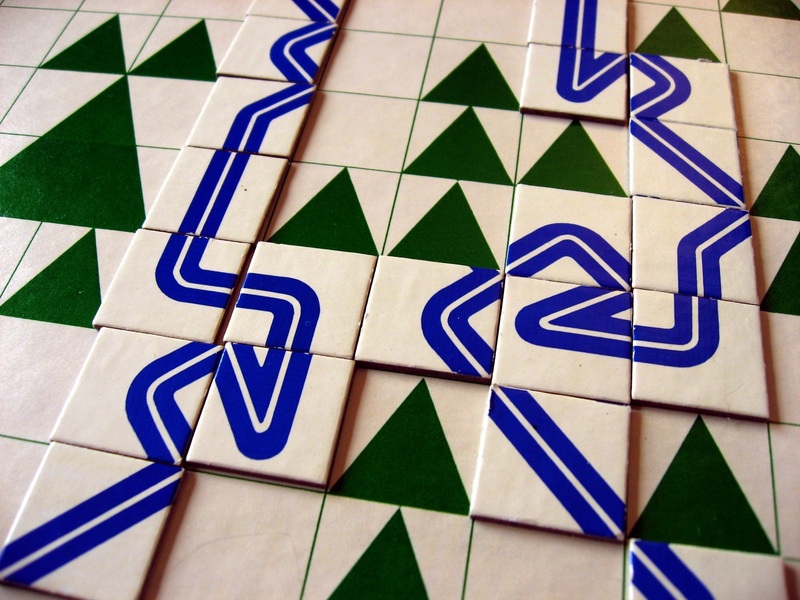 The game ends when one player makes it to the bottom of the run and players get points for finishing the course, but also for the tiles they lay, with points for corners and more points for sharper corners or crossing a track. Yellow started followed by Blue and Purple, so by Green’s turn he was squeezed into a corner and had to wriggle between the edge and Yellow’s track, as well as avoid the trees. Purple was lucky with the space she had as Blue had left her with a lot, but didn’t get the tiles she needed. Meanwhile, Blue started well and made a run for the line, but trying to weave in as many of her higher scoring tiles as she could. It looked like Blue was miles ahead, but Yellow crossed the line first, leaving everyone one turn to finish. Purple was the only one who couldn’t quite make it, though she managed to use nearly all her tiles. Blue was hampered by drawing a high scoring, but high penalty tile in the penultimate round that she couldn’t get rid of, and came joint second with Green who did remarkably well considering his difficult start. The gold medal went to Yellow though, who was not only first down the course, but was also left with the fewest penalties at the end. Learning Outcome: Old games are sometimes still good games. This entry was posted in Games Night and tagged 6 Nimmt!, Dodekka, Indigo, Ivor the Engine, Parade, The Great Downhill Ski Game on August 3, 2014 by nannyGOAT. Pizza was the order of the day, so while we were waiting for it to arrive, we played a quick game of Walk the Plank!. 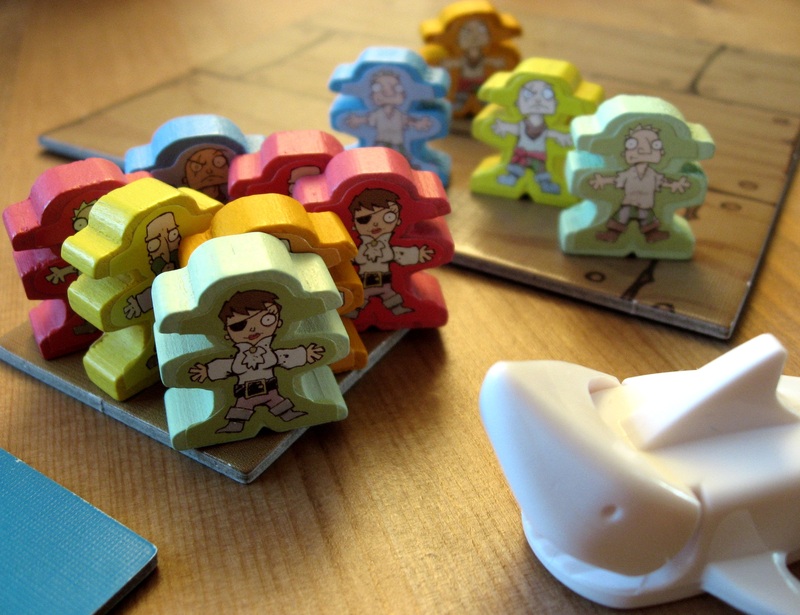 This is a very short game of kamikaze pirates that we’ve played a few times before and is great fun so long as everyone plays it in the right spirit. We started by shortening the plank, so everyone had no choice… Very quickly, most people had lost a pirate and the plank was only one square long. Red had all three of her pirates perched precariously on the end of the plank when the inevitable happened and in they all went and out went Red. Yellow quickly followed, then Green, leaving Orange and Blue to fight it out with their last remaining pirates (although the rules say the last two players share the victory, we play hard-core and stick it out to the end). Blue had the advantage of going first, but with both Pirates on the ship one remaining piece of plank between them and certain doom, it needed a bit of thought before she could finally secure victory. By this time, pizza had arrived and so had more players, so we decided to play our “Feature Game”, Spanish Bohnanza which we could do while munching. We’ve played this a lot before and always enjoy it, even though it sounds really unpromising when you explain it. With two players new to the game, we played nicely and before long everyone was happily planting “Judías” and trading “Cafeterías” for “Hippies” and “Bills” for “Booms” – and we had all thought the names were funny in English! It was a very tight game with Blue finishing only one point ahead of Black and Red who were joint second. Whenever there are new players in a game, we usually let the experienced players go first as it takes the pressure off a little and means that they get to see how it is done. Unfortunately, this meant that the last two players, who were also new to the game got one fewer turn which could have made quite a large difference given how close it was and, on reflection, it was an effect that was exaggerated with so many players. So, if we remember, perhaps we’ll house rule it in future and turn over the draw pile one last time and make sure everyone gets the same number of turns. Once the game had been set up and sheep sprinkled liberally over the Welsh hillside, players carefully chose the starting points for their waggons. Within two turns however, the first event card came out and moved everyone to Tewyn. As almost nobody had any sheep, most of us had no choice, much to the chagrin of Green who had chosen to start in Tewyn and, by the time his turn came round, all the sheep had gone and everyone else’s waggons were in his way. Nevertheless, Green started well with a couple of very lucrative errands, followed by Black. Purple meanwhile, was the only player who had been able to avoid the enforced relocation to Tewyn, and was making good progress in the “Grumbly” area of the board. Blue was feeling more than a little hard-done-by, when she found herself stuck in Ivor’s shed by a nasty, vindictive move from Green, who helped himself to a couple of “lost sheep she’d been eyeing up at the same time. He couldn’t afford to stick about for long though, and eventually Blue managed to cash in three errands, finally getting going at last. Learning Outcome: Spanish judías and German böhns are funnier than English beans. This entry was posted in Games Night and tagged Bohnanza, Ivor the Engine, Walk the Plank! on July 8, 2014 by nannyGOAT.